Paul D. Hart’s provocative short film Three Fingers premieres this week at Women Texas Film Festival. 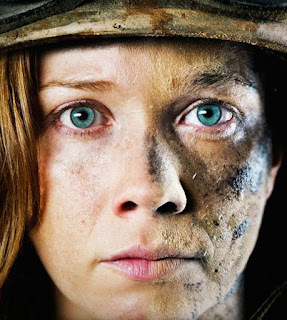 In a scant 12 minutes, the film tells the story of a young female Marine in the throes of severe PTSD, her life and marriage in a state of imbalance as she’s unable to shake the horrors of wartime experience. Three Fingers relies on some simple but effective camera tricks and perspective shots to create the fraught and imbalanced world of a soldier out of wartime. There’s little dialogue for about half the film’s runtime, laying emphasis on the expressive face and body of its protagonist (Virginia Newcomb) rather than her interaction with others. The refrain of “three fingers” recurs during the second half of the film to occasionally violent effect, though the full import of that phrase does not come home until nearly the final shots. It is to Newcomb’s credit that she manages to portray such a depth and complexity of emotion in so short a span, giving us a sense of her character without speaking a word. In fact, Three Fingers is at its best when there is no dialogue, for once dialogue comes in, it’s unfortunately a little hackneyed. Some scenes turn to simplistic clichés (the protagonist being aggressively picked up in a bar, for instance, with predictable results) to stand in for the more intense, less explicable emotions of trauma and reaction to trauma. While moving, there is nothing there that we have not seen before, often more in depth and with greater nuance. I wished that the filmmakers had not turned to clichés to represent trauma, for its most powerful moments lie in the sense that trauma can appear so banal, and that panic can spring from the mere sight of a discarded beer can. But Three Fingers finally raises itself above the clichés of a coming-home drama in its depiction of a female soldier dealing with PTSD, and in the visual and aural techniques used to place the viewer in her position. The tension and the terror come through in patches as we watch a woman trying to navigate something as simple as going for a run or washing her face, while she’s set on edge by every sound and sight. There’s a hint of resolution nearing the end, but the film is too short and the condition it depicts too fraught to allow for any simplistic conclusion. I especially like that attention is given to a person's emotional life speaking louder than their words. Much is sometimes communicated in silence. Sometimes, not speaking can covey even MORE power. Thank you, Lauren, for your thought-provoking words.